Google IoT Core provides a scalable, rapid solution development platform, made up of tightly integrated components that can be customized to help you solve your business challenges. Whether you are collecting data from a Raspberry Pi or industrial machines, the platformcan help you manage your IoT devices in real time. Pairing this powerful IoT platform with SIGNL4 can enhance your daily operations with an extension to your mobile team in the field or on the shop floor. 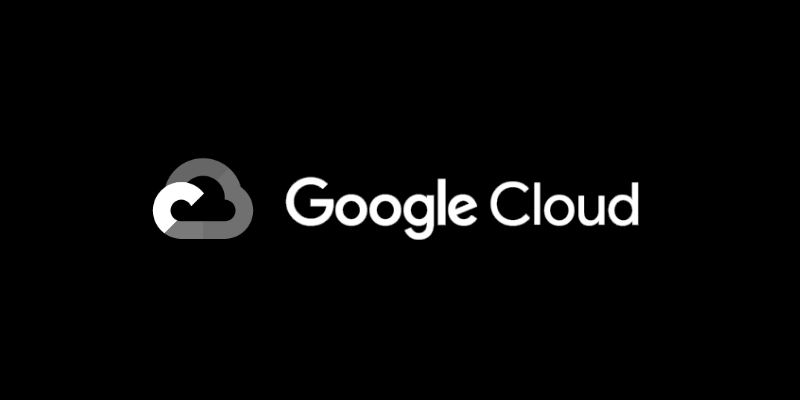 SIGNL4 integrates with Google IoT Core using a simple MQTT flow on the Google Cloud platform. Gathering events from IoT devices and sending team alerts in case of critical incidents is a broad field. Systems can involve simple prototypes using a Raspberry Pi and can expand into industrial IoT scenarios, machine data or distributed systems in the field. 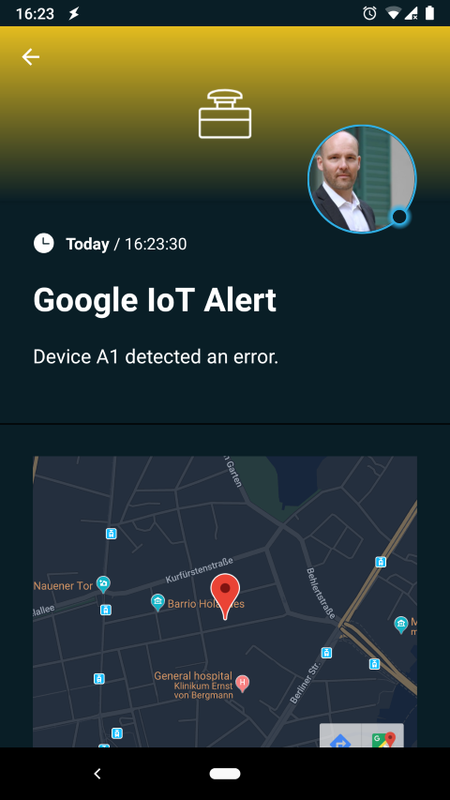 The following example demonstrates the flow of an event captured on a device through to notification of an engineer using SIGNL4 and Google IoT Core together. The good news is that the following article describes all the steps very well, except the Cloud Function part. Therefore, we will focus on the Cloud Function part that is used to send the SIGNL4 alert and only briefly mention the other steps. 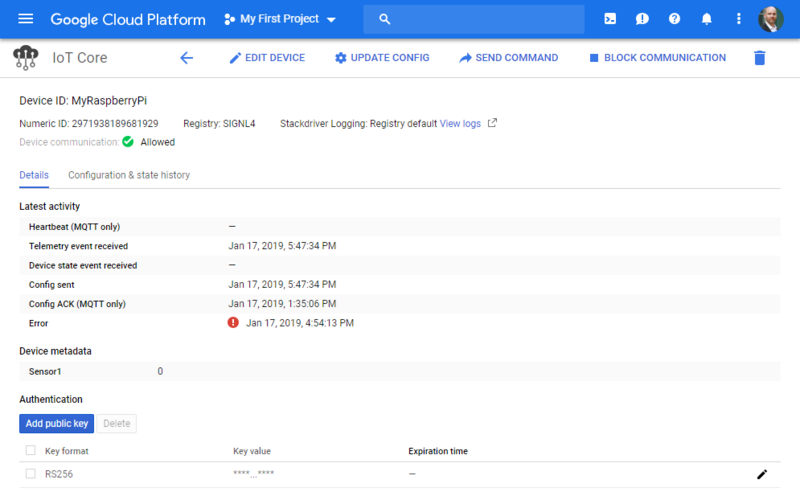 In Google Cloud IoT Core first create a registry. Then a gateway and a device. 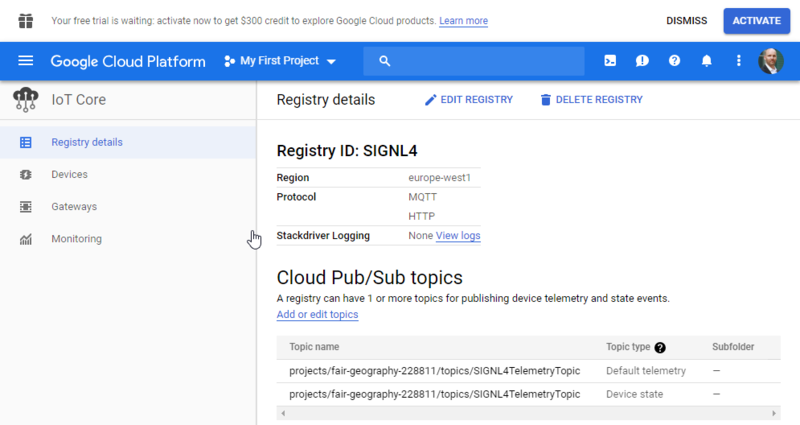 In Google IoT Cloud under Pub/Sub create a Topic and a Subscription. This sample included a Python file that can be used as is or you can modify it to match your needs. By default it sends a bunch MQTT messages. You might want to modify the code to send an MQTT messages in case a sensor detects something or a button is clicked. openssl req -x509 -nodes -newkey rsa:2048 -keyout rsa_private.pem -days 1000000 -out rsa_cert.pem -subj "/CN=unused"
And you need the Google certificate you can get with the following command. This will send the MQTT messages to the Google IoT Cloud. 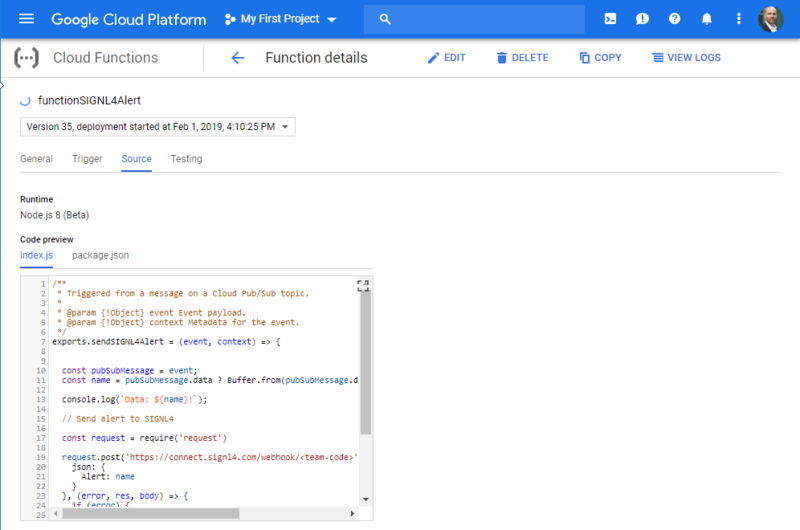 Under Google Cloud Functions you can now create a new function. This function is then being triggered by Cloud Pub/Sub. The function will take the data and then send it to SIGNL4 via HTTP POST. The sample source code is available at GitHub. Please replace by your SIGNL4 team code. Now you can test it by sending an MQTT message from your Raspberry Pi as described above. You should then receive an alert on your SIGNL4 app.